Every person that walks into your life is given an opportunity. They have the chance to make a difference. They’ve got the option to stay. They hold the key to their own destiny. There are some people you will want to stay forever. There are some people who you wish would pass through quicker than they’ll leave. While sometimes people’s impressions last longer than they do remember what’s important. In this short life your happiness is most important. People are people and we all make mistakes and yes mistakes can hurt but if a person means enough you can find forgiveness . Sometimes you’re hurt beyond repair and you just need to take some time, have some space and get on with your life that’s not always a bad thing either. I’m not saying you should completely burn people but consider the meaning they’re bringing to your life. 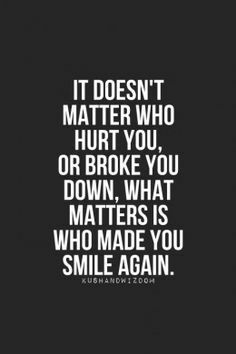 Walk a path of grace and forgiveness but remember the people who pick you up and make you smile again. When you care a lot about a person it is totally normal to continue thinking about them months even years after you’ve lost touch with them. While this person continues to cross your mind don’t feel guilty. You’re thinking about them from a different perspective. While your caring nature wonders how they’re doing and deep down you wish them the best in what they’re doing remember they’re not the reason you’re smiling. I am a firm believer in everything happening for a reason. People come into our lives to teach us lessons. Learn from every person you meet but don’t allow one negative situation deter you from finding your happiness. Sometimes happiness doesn’t have to involve another being. One of the most satisfying feelings in life is being comfortable with your own company. Being a deeply spiritual person I know how important thoughts are. Your frame of mind is paramount in achieving success. Your thoughts are your happiness. Filling your mind with the past isn’t going to help with the future and while the past has some fond memories theres a reason why they’re just memories. With each day you’ve got the opportunity to create new memories with new people. Be excited about the future. With every change comes a new beginning with exciting new prospects. Discover all of those prospects and don’t lose sight of the horizon because what’s next might be the happiest day of your life.